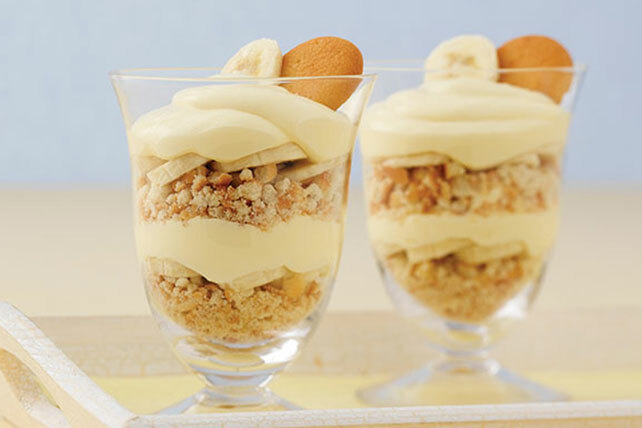 Crushed vanilla wafers and sliced bananas do double duty as ingredients and decorative flair in these creamy pudding parfaits for four. Crush 20 wafers to form coarse crumbs. Beat pudding mix and milk in medium bowl with whisk 2 min. Stir in COOL WHIP. Reserve 4 banana slices for garnish. Layer half each of the wafer crumbs and remaining bananas evenly in 4 dessert dishes; repeat layers. Refrigerate 15 min. Top with remaining wafers and reserved banana slices just before serving. To prevent the sliced bananas from turning brown, just toss them with lemon juice. Or, dip into 1 qt. cold water mixed with 3 Tbsp. lemon juice. Refrigerate until ready to use. Pat banana slices dry with paper towels before using to garnish parfaits.